Great company to deal with. Very fast shipping. Best water bottle I have ever owned. I highly recommend this product to anyone. 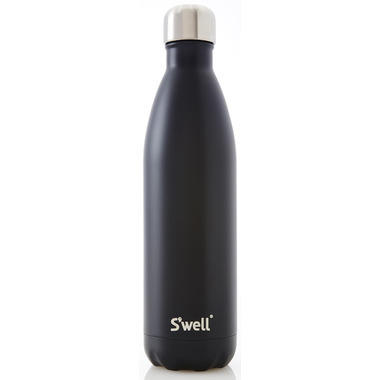 I love my S'well water bottle , it truly keeps my water cold for hours on end which I appreciate. Love the hip look of the bottle too! Only thing I noticed was a slight tinny taste when I used for hot beverage. I have already recommended to others! I bought two S'well bottles (Chimney Satin Black and Red). They kept my beverages very cold for the entire day and night. We even left one in a scorching hot car and our drink was still nice and cool. I am definitely not gentle with my bottle, though. I throw it in my purse, lunch bags, gym bags etc. and this scuffs up and chips the finish on the bottle. So be warned that the finish can be easily chipped/scuffed if it's thrown in with keys or rubbing in a tight cup holder.